David Auto now offers Texas State Vehicle Inspections! Call us today at 281-412-9388 to schedule your appointment! David Auto Collision Center located in Pearland, Texas has gained an excellent reputation as being one of the top auto body repair centers in the Greater Houston area. With over 30 years experience in automotive paint and body repair, David Rosa has the staff, knowledge and equipment to offer you the best auto paint and body repair service available for your collision repair needs. David Auto provides such a high level of professional service by employing I-Car Certified Technicians. David Auto Collision Center works with the highly acclaimed Mitchell UltraMate estimating software to give you a fast and accurate repair estimate. The Mitchell UltraMate advantage allows for written estimates to be extremely accurate in both labor and parts. This also gives David Auto Collision Center the ability to estimate with both OEM and Aftermarket parts depending on your specific needs. 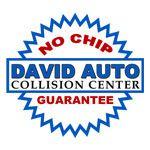 David Auto works directly with most insurance companies to ensure a quick and thorough repair of your vehicle. In addition to collision repair, auto body repair, automotive paint refinishing and frame alignment, David Auto has expanded to include a well equipped automotive repair facility with diagnostic, alignment, tire and AC Recovery services in house. Check out our internet only auto body repair special below! If you would like to obtain a free estimate for auto body repair, automotive paint refinishing, frame alignment or any other automotive services we offer, simply give David a call personally at 281-412-9388 to schedule an appointment, or stop by our shop at 2951 Manvel Rd. in Pearland, Texas. I would like to let you know that we really like the new website you have here at David Auto. We look forward to seeing what new vehicles you have for sale, and having the great description and photos online let us look at what you have to offer even late at night after work! Great Job David Auto, and we will be seeing you soon! Ask David About This Month's Special!